Women’s lives are impacted by a myriad of issues such as the frequent lack of basic services; inequality; lack of accountability of States, corporations and other global actors; discriminatory cultural stereotypes, beliefs and the impact of harmful practices; religious fundamentalisms and development agendas which exclude consideration of the rights and experiences of women and differences between women. Within this context, the International Covenant on Economic, Social and Cultural Rights (ICESCR) and the Convention on the Elimination of All forms of Discrimination Against Women (CEDAW) are the two key human rights instruments which provide a forum for demanding realization of women’s human rights. 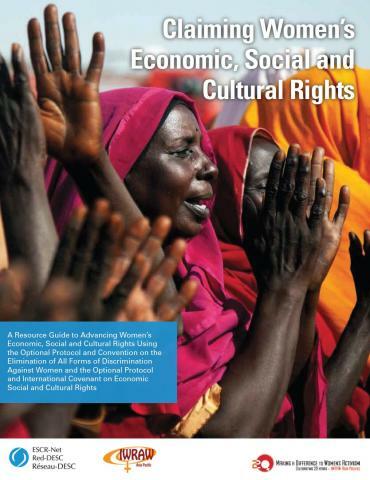 The manual below, created in conjunction with IWRAW-Asia Pacific, provides a practical guide to using both CEDAW and ICESCR as well as their complaints mechanisms to demand recognition and implementation of women's ESC rights. To download the Women’s Manual in Spanish, click here. To download the Women's Manual in French, click here. For key chapters in Arabic, please click here.